Haha, that sidewalk is ridiculous! 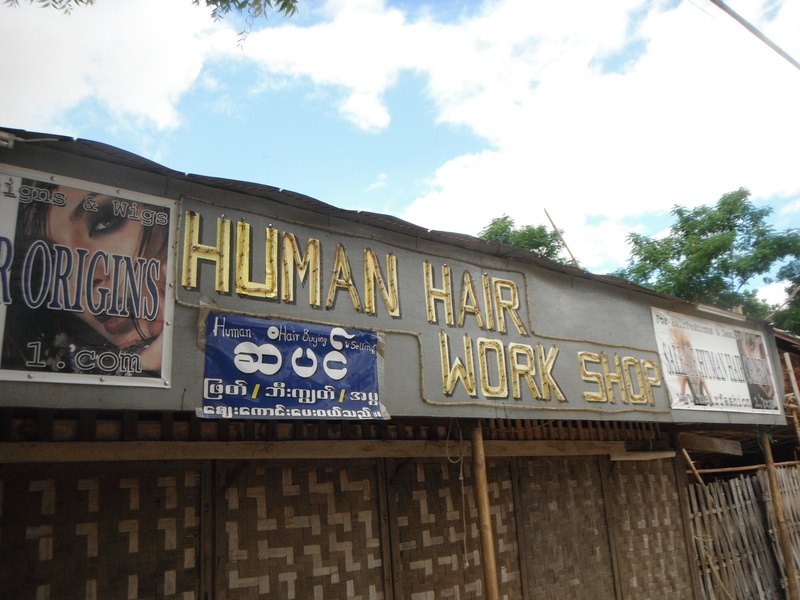 I imagine the hair workshop is using human hair to make hair pieces (wigs, toppers, falls, etc.). Not pleasant to think about them being made (working with other people’s chopped off hair all day? Ewww! ), but there’s a huge market for them in places like New York and New Jersey! Ha! It *is* ridiculous! 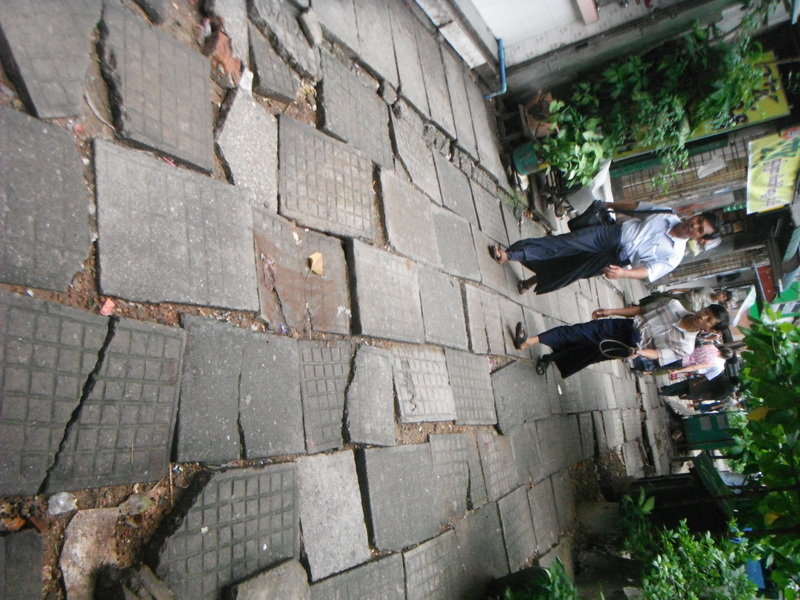 I was like–but…but…the sidewalks are all nice and wide, but you still can’t walk on them! No way! Not even a little bit interested, to be honest! To be honest, I’d probably leave it too. God knows what it contains and I’d rather not be found with it in my bag going back through customs. Just can’t imagine seeing that over here and would be curious to what it is. Hahaha this post made my day! Totally WTF!?! Try jogging on *those* sidewalks — eep! Human hair is definitely a WTF moment. 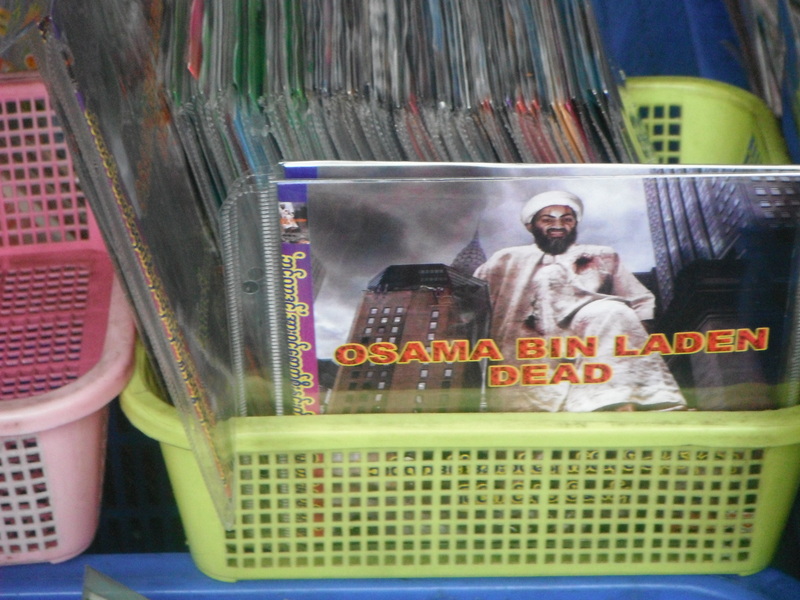 The Osama bin Laden thing … uhhhh, what? What really struck me about that photo was the sartorial juxtaposition of the men wearing polo or western dress shirts ALONG WITH sarongs. Wasn’t it the original sidewalk, just broken up? Oh my god, the western dress shirts with the longyi (the Burmese? word for the sarongs) was AWESOME. I meant to wax poetically about the longyi on men. Hubbahubba, that’s all I’m saying! I’ll give you an Honorable Mention for “juxtaposition”, but an outright win for “sartorial”! I didn’t even know what that word meant until, like, 3 years ago. And I was an English major. Yikes. i love people’s imagination and ingenuity. people don’t have phones?! ok, i’ll just buy a few and set up shop wherever and let people make calls through me. you’ve got to hand it to people; when there’s a will there’s a way. my mom’s family lives in the Philippines and they used to sell paper and pencils to the kids at school. my aunt runs/lives in her very own store house that provides products to lots of people in the neighborhood. it’s fast, convenient, and lucrative. Sell them! you might just get a taste for entrepreneurialism! or however you spell it. your blogging skills and wit will definitely help in your new endeavor. Yeahhhh and the next time someone complains about their cell phone not working I’ll send them over to your site!!!!!!!!!!!! !